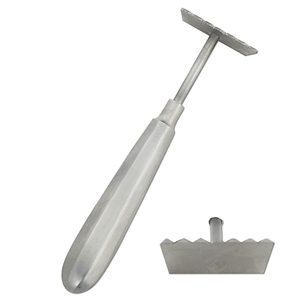 The SH422B stainless steel 7-tooth encaustic scraper fills a much needed design gap for texturing - allowing for the artist to create deep texturing cuts in their small to mid-size encaustic work. Made with solid weld technology. Approximate length - 6 1/4" and approximate width of cutting edge is 1 3/4". Companion tools - SH422A and SH422C.